You don't normally think of Petersburg, Virginia as a hotbed of R&B activity, but there were several groups in the area: the Orbits, the 5 Roses, the Velvatones, and the Continental Five. Then they got their fifth singer, tenor Joe Harper, another neighborhood resident. Now, they started calling themselves the "Continental Five." 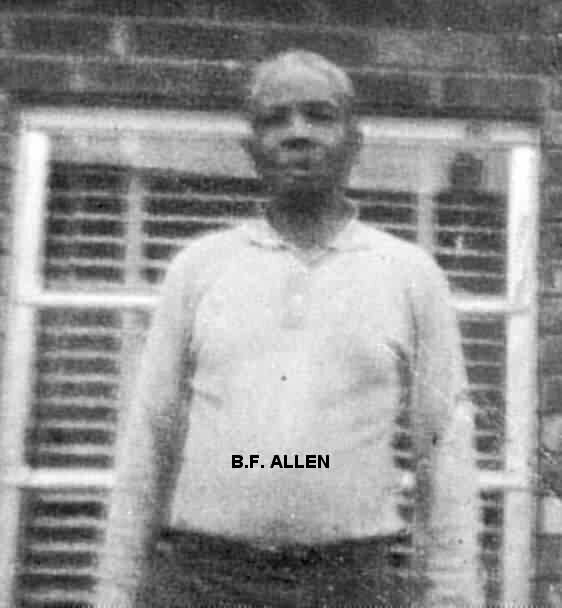 Joe Jefferson was dating a girl whose mother was dating a local character named Benjamin F. "B.F." Allen. Originally from the island of Barbados in the Caribbean, Allen was the owner of the local Nu Kat Record Shop (at 36 Halifax Street; dial REgent 2-1763). Of course, through this relationship, Allen got to meet and hear the group and decided to record them. (He may even have been the one who chose the name Continental Five.) At that point, he changed the name of his establishment to "Nu Kat Recording Studio & Record Shop." "It was hopeful for us," said Joe. "It was our chance to be in the music business." And then the songwriting began. In a way, Allen was responsible for the song "Perdelia," since he gave them the name to work with as well as a broad sketch of what he wanted; however, Clyde Robertson and Joe Jefferson actually wrote it. "My Lonely Friend" was written by Joe Jefferson and Joe Cooper. "Moe & Joe" had unknown authorship, although it seems to have been very loosely based on Louis Jordan's "Run Joe." No one remembers who wrote "King Of Rock And Roll." They worked quickly on "Perdeila," since Allen filed the copyright papers on December 10, 1957. However, as Clyde said, "He [Allen] never acknowledged anyone else; he took all the credit." 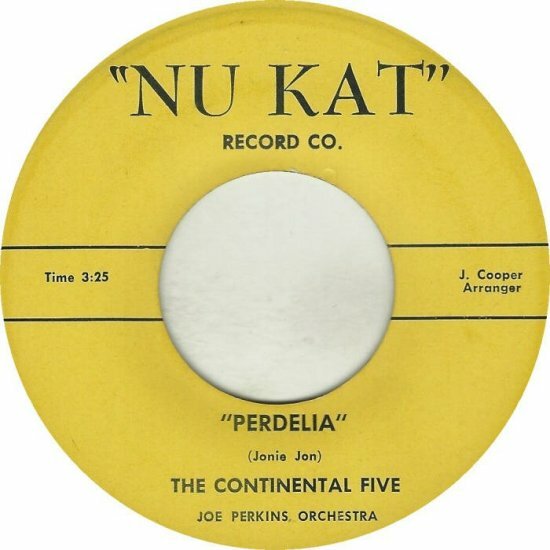 All the songs that the Continental Five recorded were credited to Allen, under his songwriting name of "Jonie Jon" (or "Johnie Jon" or "Joni Jon" - he couldn't seem to spell it the same way twice!). Said Joe, "We didn't know anything about the music business." Clyde added, "We were mad at him" [for putting his name on their songs]; "we didn't trust him. He convinced us that he could do anything." By the summer of 1958, Jerry Butler and the Impressions' "For Your Precious Love" was a big hit all over the country and that, most of all, is what both Joe and Clyde remember practicing. Joe also mentioned that they'd do Coasters songs. 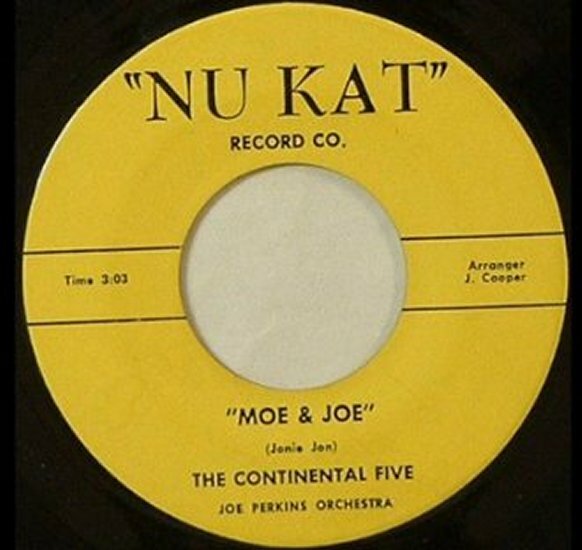 Their first record (and Nu Kat's) was the pairing of the haunting "Perdelia" (led by Clyde Robertson) and "Moe & Joe" (fronted by Joe Cooper). Recorded in the summer of 1958, the songs were backed by the local Joe Perkins Orchestra and arranged by Joe Cooper. All their recording was done at Allen's record store on 4- or 8-track tapes. "There was no studio as such," said Joe. Unfortunately, there's no definitive way of dating the record; it was released sometime between September 1958 and February 1959. 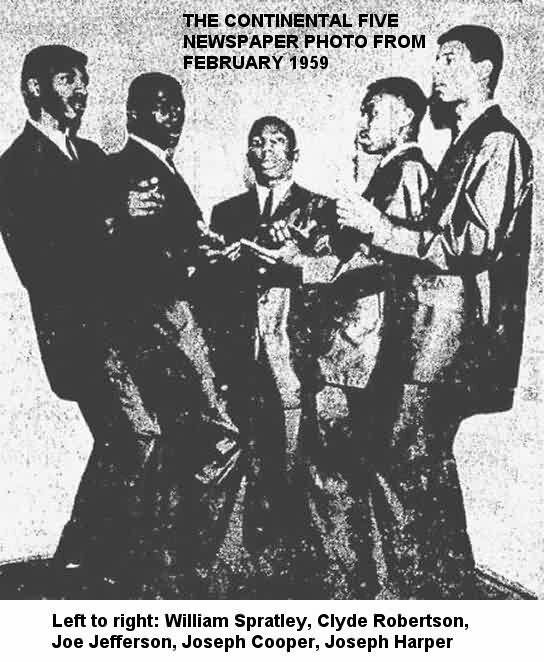 It was mentioned in the Petersburg Progress-Index of March 29, along with a photo of the group ("Petersburg Recording Stars" who could be booked for public appearances by calling RE 2 -7789). In spite of the paper calling them "recording stars," there's no evidence that the record was ever played further away than Richmond, Virginia, about 20 miles from Petersburg. At least they did get the thrill of hearing it on local stations. 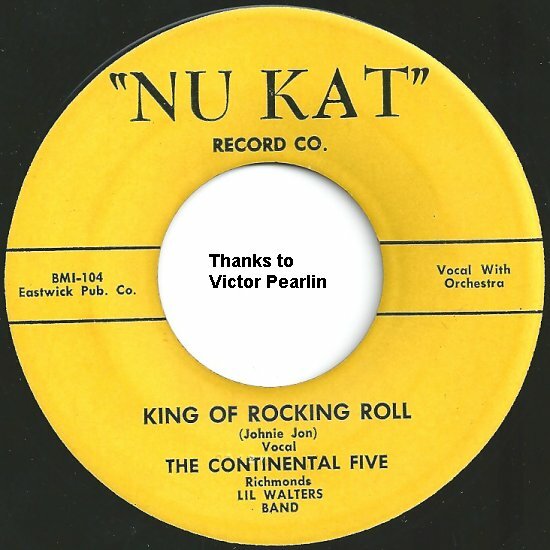 In April, Nu Kat released the second record by the Continental Five: "My Lonely Friend" (led by Joe Cooper), backed with "King Of Rock And Roll" (featuring the dual lead of Joe Jefferson and Joe Cooper); however, it was mislabeled as "King Of Rocking Roll." 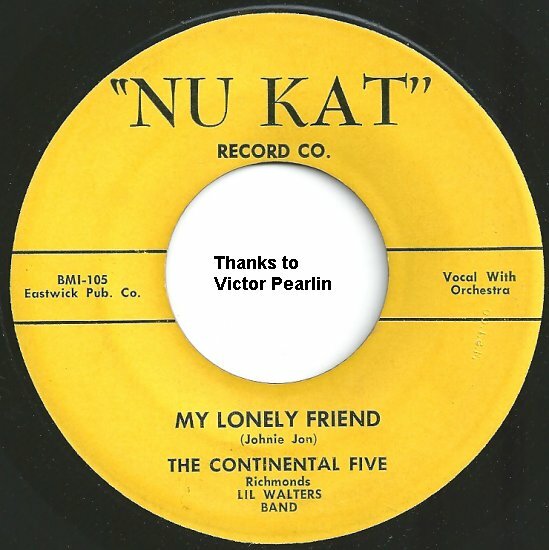 Strangely, other than on the record label, Nu Kat always referred to the top side as "Lonely Friend," never "My Lonely Friend." This time, they were backed up by "Lil Walters Band" [sic]. The Continental Five played Bill Jones' Blue Monday Club, and later on, his "World-Famous Peppermint Lounge" (which had nothing to do with the actual world-famous one in New York). There was also the local Sportsman's Club (they were there on July 27, 1959), as well as other venues in Richmond. The guys never treated it as more than a series of weekend jobs, however. 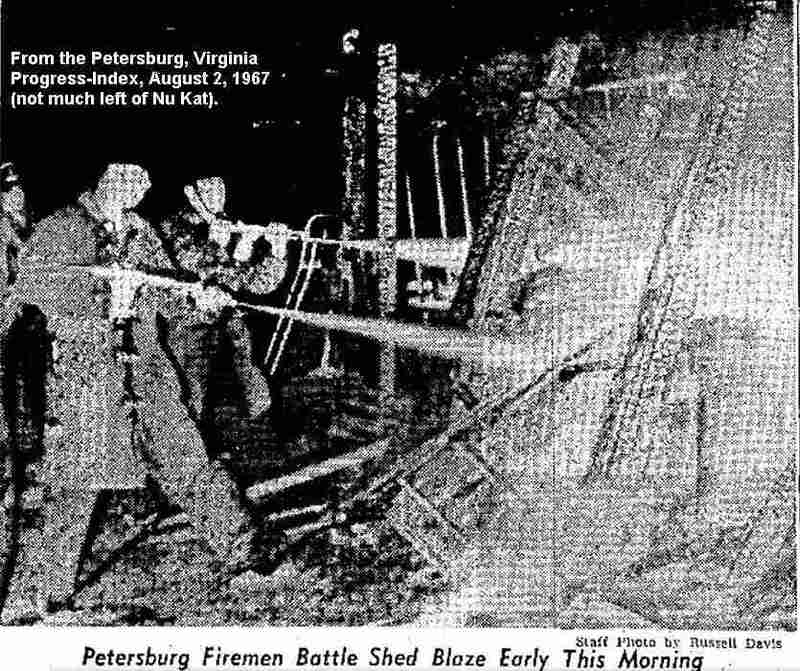 A November 1959 blurb reported that civic-minded Nu Kat was going to enter a float in the annual Petersburg Christmas parade. On June 8, 1961, someone named John "Peg" Rogers was accused of breaking into the Nu Kat store and stealing $150 worth of merchandise (which was increased to $300 a couple of days later). 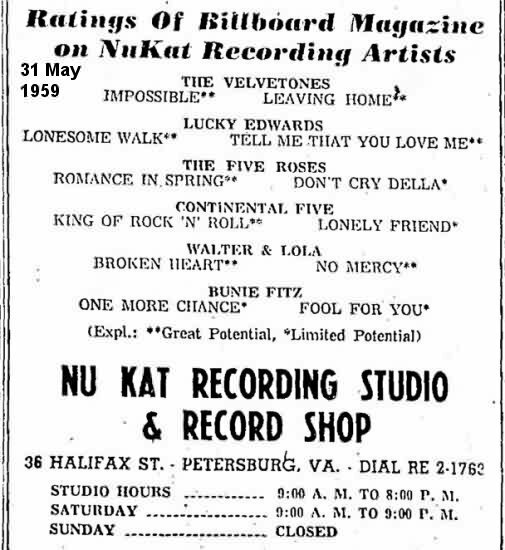 Nu Kat continued on, holding talent shows at Petersburg's Gem Theater in 1962. 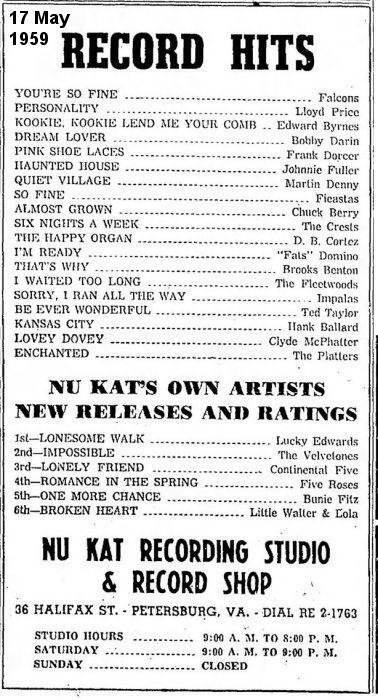 However, by early 1963, B.F. Allen had given up on the whole thing (a blurb on June 7, 1963 said that the Nu Kat Record Shop had re-opened under new management, although no further details were given). Allen relocated most of his files and master tapes to a shed on his property on Baylor's Lane, but the shed was destroyed by a fire on August 2, 1967. The Continental Five continued on for a couple of years, playing weekend gigs at various local clubs. But with no success, it was only a matter of time before they fell apart. Finally, in 1961, Joe Jefferson went into the Army and that was pretty much it for the group. Also by that time, Clyde, whose car they used to get to gigs, was getting annoyed that the other guys left responsibility for all the car repairs to him. In the Army, Joe started honing his drumming skills and, when he was discharged, just "hung around for a while" before deciding that he was going to be a musician. He got to be well-known locally and then came his big break. 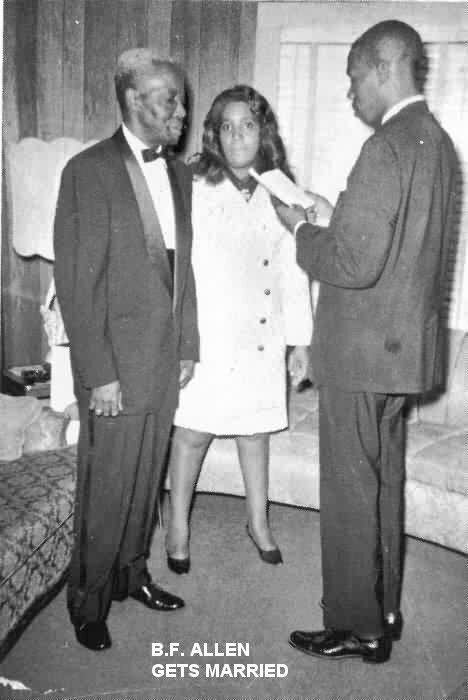 One night, he went to see the Manhattans at the Sahara Club in Richmond. Between the first and second shows, their drummer took ill. Someone there knew Joe could play drums and recommended him to the Manhattans as a handy replacement. He did their second show with them and they were impressed. So much so that they asked him to go on the road as their regular drummer. They were probably surprised when he turned them down! Back at home, he spent a couple of months thinking about it and talking it over with his mother. Finally, he relented, contacted them, and moved to Jersey City, the Manhattans' base of operations. Joe remained with the Manhattans for two or three years and then, around 1967, became the drummer for the Sweet Inspirations. He ended up leaving that group for a reason that most of us will never experience: they played a concert at Carnegie Hall and Joe realized that was (and would remain) the pinnacle of his drumming career. If you can't get any better, quit and do something else. That something else was forming another group. Helped out by old friend Bill Jones (the Petersburg nightclub owner), Joe formed the Nat Turner Rebellion (named after an 1831 uprising by slaves in Southampton County, Virginia). 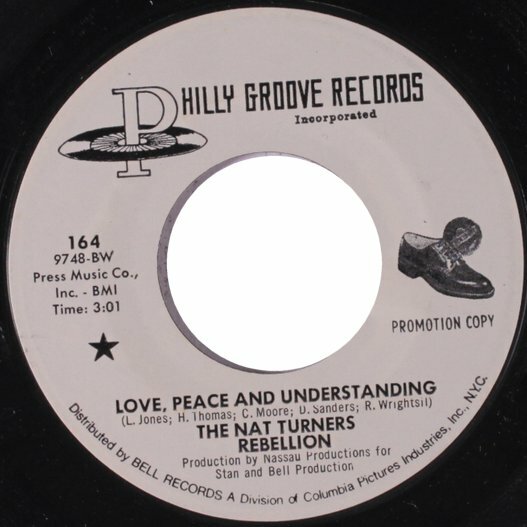 The Nat Turner Rebellion hooked up with Stan Watson and Sam Bell's Philly Groove Records in 1969. 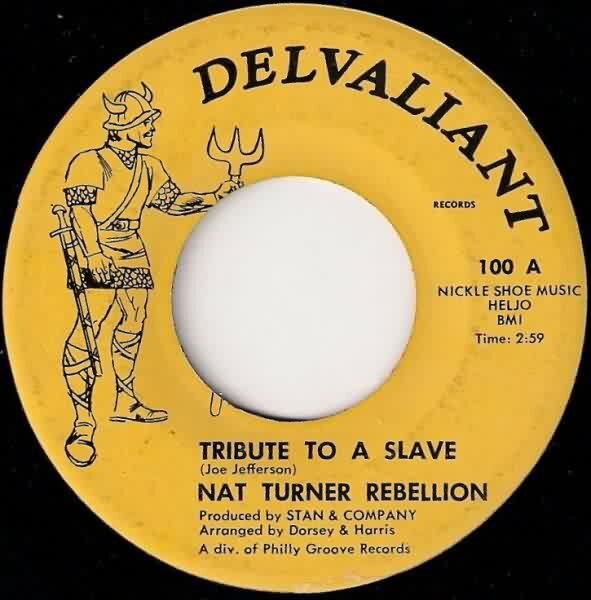 Their first release, "Tribute To A Slave" (written by Joe), was issued that year on Delvaliant, a subsidiary of Philly Groove. (Other releases have the label spelled "Del-Valiant.") The flip was "Plastic People." 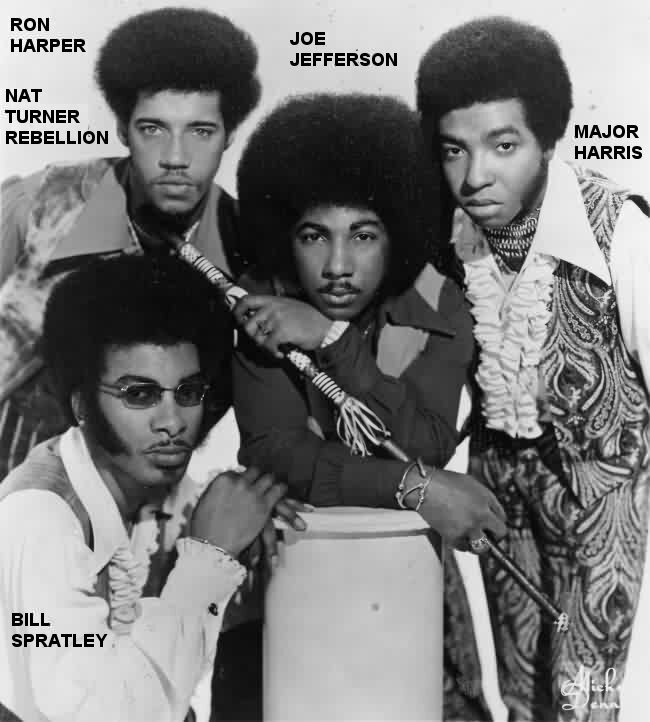 While the record wasn't a hit, on August 26, 1970, the Nat Turner Rebellion began a week at the Apollo Theater along with the Delfonics, Kool & the Gang, Brenda & the Tabulations, and the Intrigues. The group's second record ("Love, Peace And Understanding"/"Getting Higher") was released on Philly Groove itself in October 1970. This was followed, in the summer of 1971, by "Can't Go On Livin"/"Laugh To Keep From Crying," on Philly Soulville, another subsidiary. 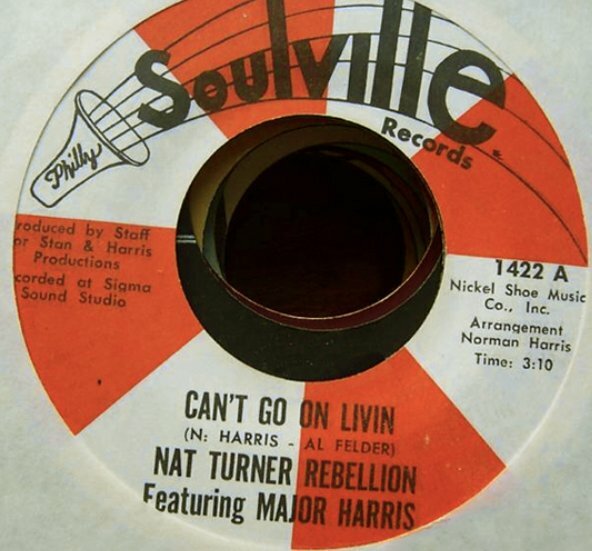 By the time that record came out, however, Major Harris was gone and the Nat Turner Rebellion was too. According to Joe, they just "… fell apart; a lot of head trips. It was all about money." Their last appearance, around April 1971, was at Virginia State College. Major Harris then replaced Randy Cain in the Delfonics. He'd leave them in 1974 to go solo. Recording for Atlantic, he had a #1 hit with "Love Won't Let Me Wait" in the spring of 1975. 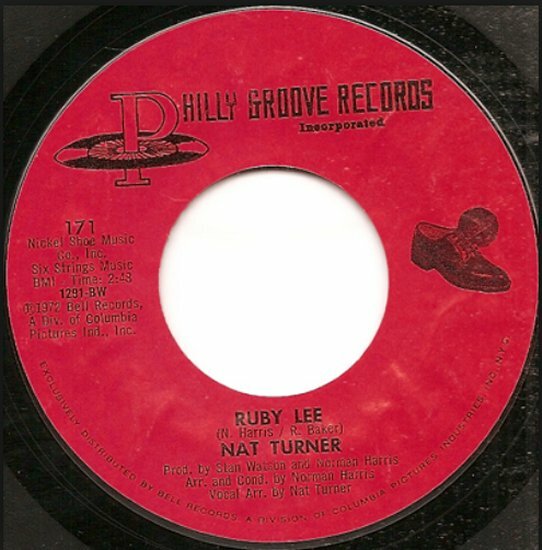 There was one further record by the Nat Turner Rebellion (although the label only credited "Nat Turner"): the old masters "Ruby Lee" and "You Are My Sun Sign," were issued on Philly Groove around April 1972. 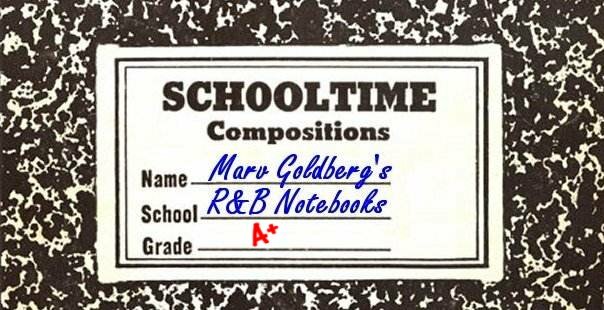 Unreleased Philly Groove tunes included "Care" and "McBride's Daughter." After that, Joe Jefferson pretty much stuck to songwriting. You can see his work as "Joe Jefferson," "J.B. Jefferson," and "Joseph Banks Jefferson." Some of his songs that you might know are these Spinners hits: "One Of A Kind (Love Affair)," "They Just Can't Stop It (Games People Play)," "Mighty Love," "Sadie," and "Love Don't Love Nobody," as well as the O'Jays' "Brandy." The Continental Five didn't make the slightest impact on the musical world. Not from lack of talent, but because they recorded for a local label that probably wasn't even distributed to much of Virginia, let alone the rest of the country. They didn't stand a chance.